Using classroom strategies can help land your ultimate concepts. I used to be a terrible teacher. When I captained my college ultimate team, my teaching style could be best described as YELLING. Later, I actually became a professional educator and I’m sure my college teammates were shocked. As an educator I learned that great teaching can be quickly translated to the ultimate field. Whether your goal is to improve player retention , or take your already successful team to the next level, taking an analytical look at your approach to teaching is critical. Most great teaching follows a pattern: know your learner, set realistic and measurable goals, use backward planning, give and receive feedback, and assessing the teaching. The order of these steps is important. A majority of terrible teaching uses these same steps, but in the wrong order. As I became a more experienced educator, I realized that many of the approaches I had both seen and used to teach ultimate did not follow best practices for successful teaching. As a coach, captain, or a more experienced player trying to help out a teammate, the first step in quality teaching is to think about your student. Who is your learner? What motivates them? How do they learn best? What do they need to learn? Asking these questions will guide your teaching so that each person is more likely to learn effectively. Every learner is different. This means there is no universal approach to effective teaching. What you need to know is that all of your players/teammates are different and each has different learning needs. You’ll need to get to know the people you’re teaching if you want to be effective. Show up early and talk, ask questions during warm ups, meet outside of practice. Whatever your plan, be genuine in your approach by putting the needs of your learner first. A classic example of what not to do is the State Your Goals Huddle. This is the huddle where we go around and everyone has to say something they want to improve. This activity is ineffective because only an experienced, knowledgeable, and confident player can easily admit to the group what they need to work on. The rest of the group, which includes the players who need to learn the most, won’t know what to say. This means your teaching will be based on bad information and will be unlikely to make a meaningful difference. Imagine showing up to school on the first day and having the teacher say, “Ok, now we’re going to go around and everyone is going to tell us what they don’t know.” Would you be excited to come back to class the next day? Building a relationship with your learner is the first step in establishing trust which is critical to effective teaching. A better use of early-season huddles is to work on team chemistry by providing a platform for everyone on the team to speak and get to know one another. Playcalling and strategy is unlikely to make a huge difference for your team, especially in the first week of league. What is more important is knowing who your players are and where they feel comfortable and can make a positive impact on the field. In the future, when teaching strategy during a team huddle, pick one goal to discuss and present it in a way that everyone on the roster can understand. Resist the urge to present too much information too soon, and set a team goal that everyone understands and has a chance to participate in accomplishing. A good place to start might be setting a goal for the number of breakmark throws allowed each half, or cuts to the break side on offense. Once you know who you are teaching, you’ve got to decide what to teach, and how it can be measured. If you’re teaching a new player how to throw a flick, be specific in saying that the first thing you want to teach them is a flick that will fly straight for 10 yards. “Play better D” is not measurable, which means players won’t know when they’re playing defense correctly. Make sure that the goals you set are realistic for the player(s) you are teaching, and don’t be afraid to start small. Adding more goals is much easier than undoing the effects of trying to teach too much too soon. You’ve set a goal and decided how it can be measured. Next define the steps necessary to achieve the goal. Teaching a flick might be broken down into foot position, grip, arm movement, and release and then taught in that order. By defining these steps for your learner, and teaching them in a logical order, you build a foundation for the player to improve without your direct supervision. In other words, you’ve made the new knowledge manageable by presenting it as a list of smaller, easier steps rather than one complicated topic. At this point, your learner is directly involved in learning. They are practicing their flick, or thinking differently about their position in your defensive scheme, but they haven’t yet met the measurable goal you established earlier. Keep in mind that the most effective feedback is positive, or has a positive element. Even when someone is doing a terrible job, you need to find a way to give them something to feel good about. Asking people to learn from you requires trust, and it’s difficult to place trust in someone who always has something negative to say about your efforts. As a teacher, you must also be open to feedback from your student. Ask them if what you’re saying makes sense, or if they’d like another example. When you get feedback from your students about your teaching, take it to heart and integrate the feedback towards an alternate approach. If they’re telling you they don’t understand, there’s no reason not to believe them. Try something different and ask if that works better. If your student says, “I tightened my grip, but the disc still wobbles. What do I do?” you shouldn’t just repeat earlier instructions. Instead, try demonstrating proper grip technique or give a different verbal description of the grip and throwing process. Have faith that you can find an approach that will work and be patient with your student as they learn and improve. The final step in effective teaching is assessing performance in terms of the measurable goal you established. Whether this goal was achieved is a direct reflection of your teaching ability. Yes, there are in-game factors and decisions that you cannot control, but overall your players’ performance on the field is a product of your approach to teaching. Do you have a player who makes the same mistake over and over, despite how many times you’ve told them not to? The issue here is not in the ability of your player, but in your ability to teach them in an effective manner which results in knowledge being gained and applied in-game. This connects directly back to knowing your learner. Your approach to teaching won’t always be right the first time, and the process will need to be repeated. Using player performance to inform and adjust your teaching approach will improve your effectiveness as a teacher. As your teaching improves, so will player performance. Whether or not you see teaching as a part of your role on the field, your team can benefit from better teaching because the need for effective education exists at every level of the game. Each time you give feedback or offer advice to a player, you are teaching. Take it from someone who’s learned the lesson already—instead of YELLING, pause for a moment to think about effective teaching and the real difference it can make in the game. 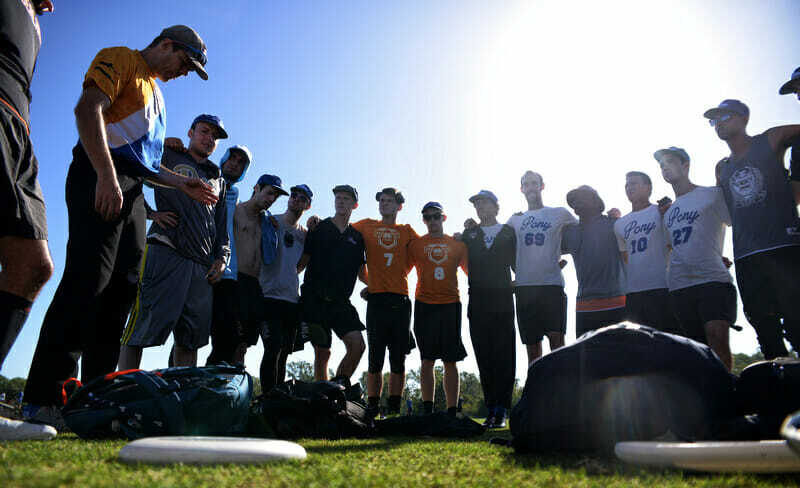 Comments on "Tuesday Tips: How To Use Classroom Techniques To Teach Ultimate Skills, Presented By Spin Ultimate"